Bioré Top Products Review 2018: Get More From Bioré! Home | Reviews | Bioré Top Products Review 2019: Get More From Bioré! Bioré Top Products Review 2019: Get More From Bioré! Do The Pore Strips Work? 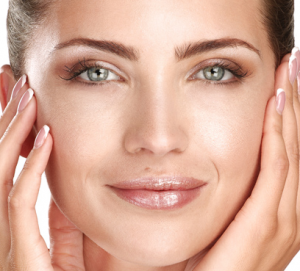 There are a lot of different approaches to skin care. 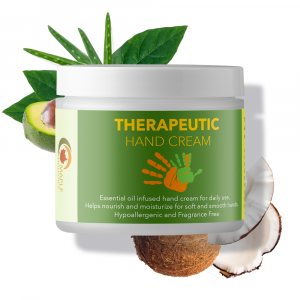 These approaches are represented by the products and treatments produced by a large number of different personal care products companies, including Lush, Neutrogena, Olay, L’Oréal, Nivea, and Dove. All of these companies manufacture products designed to improve the health and appearance of skin, and they do this by focusing on a number of skin-related issues. 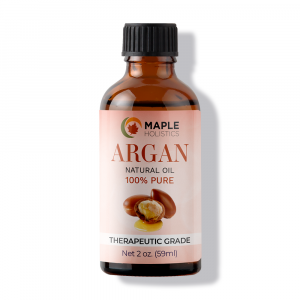 There is only one company, however, that devotes all of its time, energy, and manufacturing capabilities to the most vital area of skin care: pore care. That company is Bioré. Clean pores for clean skin. A brand subsidiary of the Japanese cosmetics company Kao Corporation, Bioré is the only major skin products manufacturer that places pore care above all other areas of skin care. Why are pores so important, you ask? Clear pores are the key to clear skin. Pores are small hair follicle openings on the skin’s surface, and the rule of thumb is generally that the bigger your pores, the less attractive your skin. Don’t Be Dirty: Baking Soda Pore Cleanser, Baking Soda Cleansing Scrub, Deep Pore Charcoal Cleanser, Self-Heating One Minute Mask, Pore Unclogging Scrub, Combination Skin Balancing Cleanser, Daily Deep Pore Cleansing Cloths, Pore Penetrating Charcoal Bar. Back Off Big Pores: Charcoal Pore Minimizer. Acne’s Outta Here: Blemish Fighting Astringent, Acne Clearing Scrub, Blemish Fighting Ice Cleanser. Breakup With Blackheads: Ultra Deep Cleansing Pore Strips, Deep Cleansing Pore Strips, Warming Anti-Blackhead Cleanser, Deep Cleansing Pore Strips Combo, Deep Cleansing Charcoal Pore Strips. Using ingredients such as salicylic acid, which penetrates the follicle and tightens pores, Bioré products are capable of fighting against pore problems in the short- and long-term. That’s what makes Bioré so unique – a company that tackles the number-one skin problem with a full range of products and utter precision. What could possibly be better? If you’re interested in Bioré products but don’t know where to begin, worry not – this is our Bioré top products review! If you’re interested in skin care, you’re bound to have heard of skin strips for the nose. By applying the adhesive side to your nose and peeling, these nasal strips are capable of cleaning the skin and pores of unwanted dirt, oil, and other harmful skin irritants. 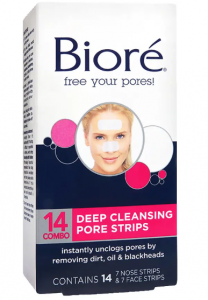 Being the number-one purveyor of pore products out there, it’s only natural that Bioré produces its own strips, and it does in their deep cleansing pore strips. An oil-free product, Bioré strips clean and invigorate pores with deep cleansing action. 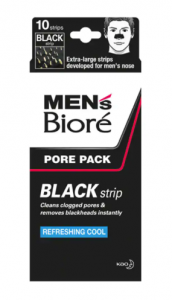 By extracting built-up dirt and oil from the pores with a particularly strong strip, Bioré helps you prevent a number of skin-related maladies, but in particular blackheads. Unscented and dermatologist-recommended, Bioré deep cleansing pore strips are cleared for usage with even the most sensitive skin – give them a try if you want to start eliminating your blackheads and minimizing your pores today! Do Bioré Pore Strips Work? In a word, yes. In the interest of full disclosure, I count myself as one of the poor souls who has suffered from terrible clogging of the pores, and a bad bout of blackheads as a result. I couldn’t believe my eyes when I peeled back my first Bioré pore strip and saw the sheer volute of dirt and black that had been removed – it was a truly eye-opening experience! It took time for the strips to do their work and effectively rid my pores of the majority of the dirt and oils, but slowly my skin did become clear, and my blackheads became a thing of the past. I can’t recommend these strips highly enough. While pore strips are great for loosening dirt and oil clogged in the pores, there’s only so much they can do against the really stubborn dirt that is the result of long-term buildup and skin neglect. Bioré Charcoal Deep Pore Cleanser is designed to target the tough-to-shake clogging of the pores and do the job that strips can’t. By targeting deep-down impurities, the cleanser reaches the depths of your pores in order to deliver a cleaning that eliminates 100% of impurities. Charcoal is known for being capable of drawing out and eliminating impurities, which makes it an ideal ingredient in any skin cleanser – it certainly does the job here for Bioré. The company boasts that the Charcoal Deep Pore Cleanser draws out and scrubs twice as much dirt as a basic cleanser – give it a try to experience this deep clean for yourself. 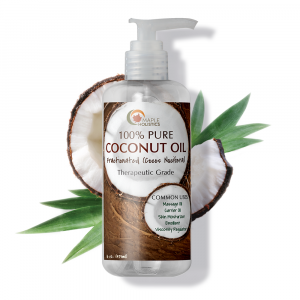 Looking for a scrub that can clear your pores and smooth your skin in the process? Bioré Pore Unclogging Scrub manages to treat clogged pores, preventing blemishes and unsightliness, while simultaneously cleansing and clearing the skin to leave it smooth and presentable. The scrub utilizes spherical, non-jagged beads in order to powerfully scrub the skin and pores, washing away impurities, buffing and smoothing the skin in the process. 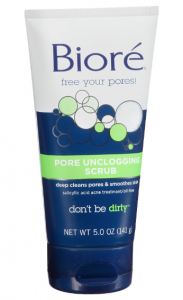 Oil-free and dermatologist recommended, Bioré Pore Unclogging Scrub is the ideal hybrid cleanser/smoother of skin. The reality of our species is such that men and women are not created equal. The texture, conditioning, and behavior of male skin does in fact differ from that of female skin. This is why it’s vital that men and women have products that are made to accommodate these qualities, as Bioré offers in its Mens Bioré Blackhead Strips. By tightening pores so that they become less noticeable, the blackhead strips are made to attack stubborn male pores. These are powerful strips, and not recommended for use more than once a week, but they do in fact get the job done. Perfect for male teens struggling with oily skin and clogged pores! One shortcoming in regards to common sunscreens that many folks don’t consider is that of pore clogging. Yes, traditional sunscreens utilize ingredients that may protect your skin from the sun, but they can harm your skin by clogging pores in the process. For sensitive skin that is prone to breakouts or clogged pores, there’s no better sunscreen than Bioré Sunscreen. The formula utilizes a high PA++++ rating to fight UVA and UVB rays while cutting back on ingredients that are harmful to the skin. This allows Bioré Sunscreen to protect the skin from the sun without leaving it prone to clogged pores. Bioré has produced a light, pleasant formula that absorbs easily and features a pleasant odor – you really just cannot go wrong with Bioré Sunscreen. It protects your skin in every way! UV Perfect Face Milk – another excellent sunscreen from Bioré – could just become your favorite beachtime accessory. 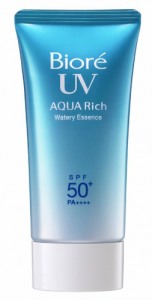 An Asian sunscreen, Face Milk is more cosmetically inclined, more watery, and less greasy than your typical Western sunscreens. 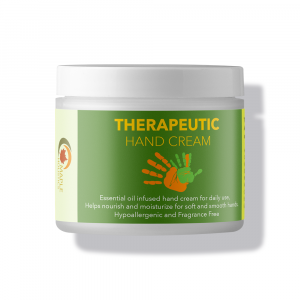 This helps Face Milk protect your skin from not only the sun, but dirt and oil as well. Forget about unclogging or clearing pores – how about defending against pore problems before they ever rear their ugly head? Bioré Blemish Fighting Ice Cleanser does the job. This salicylic acid acne treatment from Bioré invigorates and causes a cooling sensation as it cleanses, clearing and cleaning the skin in order to prevent dirt and oil from ever building up in the skin. Gentle and safe enough for everyday use, Bioré Blemish Fighting Ice Cleanser makes for an excellent everyday cleaner in that it helps ensure you will not need to turn to Bioré’s other products, as your pores will never become clogged in the first place! 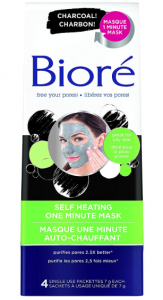 Bioré already provides cleansers, strips, and washes for the skin – why not masks? Bioré’s unique self-heating one minute mask heats on contact with water in order to open pores and draw pore-clogging dirt and oils to the surface of the skin. After mask removal, the skin is left feeling cool, clean, and refreshed! Bioré utilizes charcoal once again in this excellent product, as charcoal aids the mask in drawing impurities out of pores in order to cleanse the skin. After rinsing off the mask, you will be sure to notice immediate results – glowing skin, reduced redness, and a more even skin tone are among some of the great short-term benefits you’ll be enjoying. But don’t forget about the long-term benefits! Bioré Self-Heating Mask is sure to leave your skin less susceptible to future pore-clogging – so you won’t ever need another mask! 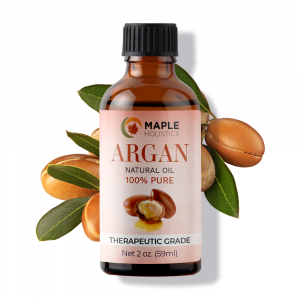 One thing you’re sure to be going to want to take advantage of after reading about all of these great products are Bioré coupons. Available from the Bioré Facebook page and official website, Bioré coupons help make great products just a little more affordable. Bioré always has some good promotions running, so be sure to stay on top of things in order to make sure you’re getting maximum value out of your Bioré purchases. 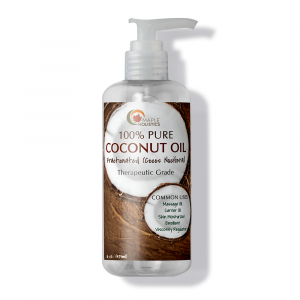 Be sure to check back for more on great beauty brands here at Maple Holistics! 2 Tablespoons of Unflavored Gelatin. 3-4 Tablespoons of Milk (any kind works, but whole milk works best). Place the gelatin into a disposable container, add the milk, and mix the combination until you have a honey-like thickness and consistency. Microwave the combination for 10-20 seconds until it is nice and creamy, and voila! You’re good to go with your very own homemade Bioré strips! Be sure to apply the mixture as quickly as possible after microwaving because the stuff does tend to dry quickly. There you have it, the very best in pore care and skincare from Bioré! Now that you’re ready to take on the world of Bioré, you’ll never have a problem with another pore!